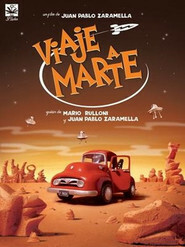 Journey to Mars (Viaje a Marte) is an animated stop motion short film. This independent production, which was made in Argentina, is the result of two years hard work. Since then, it has won 50 awards in different festivals around the world, competing in many cases against real action productions. The short tells the story of Antonio, a boy from the 60s, who is a great fan of science fiction tv serials and space trips. In view of the child's passion, his grandfather decides to take him to Mars in his tow truck.